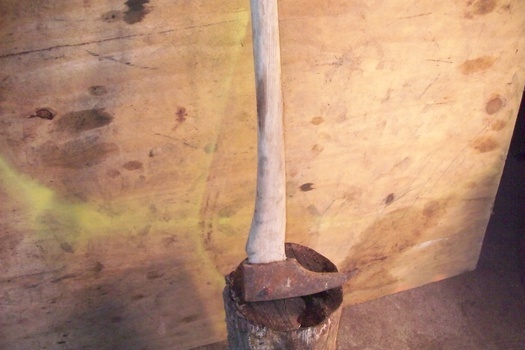 If anyone has n idea what this is,I'd appreciate hearing it,the handle is a regular axe handle and it fits ok,I can't imagine that it's a pulling tool,the wood handle would break to easy. It's called an ADZ, for root chopping, a real sharp one can be used for shaping wood logs into cabin timbers( Squaring off the ends)....handle would have been different originally, note the bolt through the head, that is NOT original..
Are you sure?All the adz that I ever saw had a wide blade,not a point. I should get a picture of it from the tip,it reminds me of some type of tool that would be used in the same general manner as an adz but I don't now what. The bolt through the head is still not original, and it appears that the flat side has done some striking...It may have been a rail road 'jack' used from when they did it all by hand..............just a guess ! This tool was used by my Grandfather. He worked in the shipyards in Nyack, NY on PT boats carving out the wood for the hulls. It is called an ADZ according to my dad. All ADZ I've used or have seen have a hoe type blade with a sharp edge a few such as in some of these pictures have a spike on the back but all have had had a square handle hole also. I have one in my barn I'll have to post it. Here is a site you may want to look at. An Adz is made for squaring large timbers that little spike wont do job it will only split the grain. 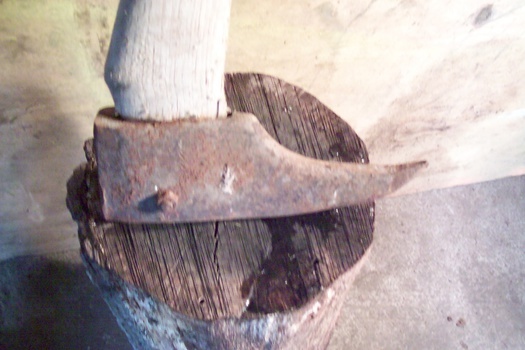 As you can see the ADZ in this post have squared ax handles this leads me to believe it isn't one. But there are some in this with a hole for an ax handle. Maybe the blade broke off of yours? As you can see all of the adz handles for sale are square in this post. Motoolz is right, this is a short handled one the long handled ones were used when floating logs down stream on a river. This one was probably used at the saw mill. I have a scar on my right leg from on of this. I was working on a pulpwood yard where we loaded the pulpwood into rail cars. We used these to strengthen the wood so it would lay straight.